Developing powerful hand-held drift tube ion mobility spectrometers (IMS) requires small, lightweight drift tubes with high analytical performance. 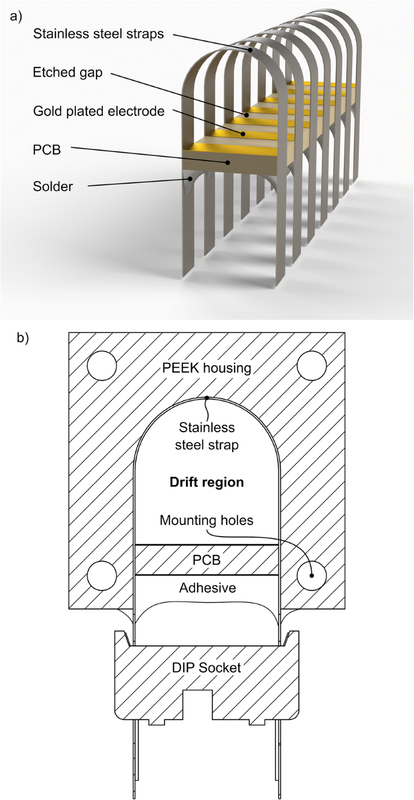 In this work, we present an easy-to-manufacture, miniaturized drift tube ion mobility spectrometer, which is manufactured from polyether ether ketone, stainless steel foils and printed circuit boards. It is possible to operate the drift tube IMS with a radioactive 3H ionization source or a non-radioactive X-ray ionization source with 3 kV acceleration voltage. The drift tube design provides high resolving power of Rp = 63 at a drift length of just 40 mm, 15 mm × 15 mm in cross-section (outer dimensions) and a drift voltage of 2.5 kV. The limits of detection for less than one second of averaging are 40 pptv for dimethyl-methylphosphonate and 30 pptv for methyl salicylate. 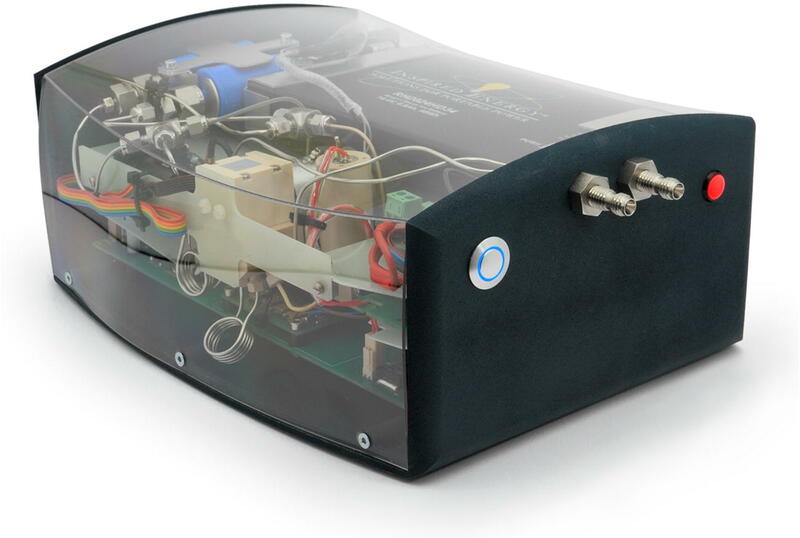 For demonstration, the miniaturized drift tube IMS is integrated into a stand-alone battery-powered mobile device, including a closed gas-loop, high performance driver electronics and wireless data transmission. In a proof-of-concept study, this device was tested in an international field evaluation exercise to detect the release of a volatile, hazardous substance inside a large entry hall. 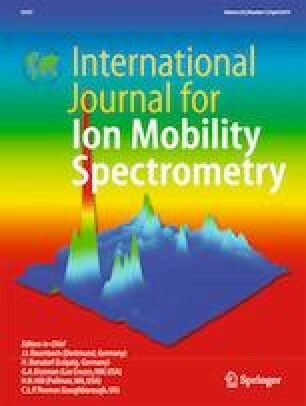 During the past decades, ion mobility spectrometers (IMS) have been established in various kinds of applications [1, 2, 3, 4], while safety and security application still make up the largest share. Some IMS are used as stationary detectors for monitoring purpose; others are embedded into mobile or hand-held devices [5, 6, 7]. Especially in the latter case, compact, robust, lightweight and low cost drift tubes are required to provide easy to operate, hand-held devices. Thus, in recent years, several groups worked on the development of miniaturized drift tubes IMS. Some designs are based on low temperature co-fired ceramic (LTCC) . Other designs use stacked electrode-insulator-pairs [6, 9] or printed circuit boards [10, 11]. However, the key challenge of miniaturization is to maintain the analytical performance of the IMS, which strongly depends on the geometrical dimensions of the drift tube [10, 12]. In drift tube IMS, ion separation is based on the motion of ions along the axis of the drift tube driven by a homogeneous electrical field. Two important performance indicators of IMS are the resolving power Rp and the limits of detection (LoD). The resolving power, see Eq. 1, is defined as the quotient of the drift time td and the full width at half maximum wFWHM of a peak in the spectrum. Typically, the LoD is defined as the concentration generating a signal amplitude equal to three times the standard deviation σ of the noise at zero concentration. Furthermore, ion mobility is given as reduced ion mobility K0, see Eq. 2, where L is drift length, Ud is drift voltage, T0 = 273,15 K, p0 = 1013,25 mbar, T is operating temperature and p is operating pressure. In this work, we show a drift tube design, which is suitable for low cost and portable applications while maintaining the resolving power of laboratory-grade systems. The design is based on stainless steel straps, which are bended over a printed circuit board (PCB) and form the drift electrodes. Since the drift electrodes are connected to a dual-in-line package (DIP) footprint, the drift tube is easy to integrate simply being an electrical part of the driver electronics of the system. The basic layout of the drift tube presented in this work is similar to typical drift tube designs, consisting of an ionization region, an ion gate, a drift region and a shielded Faraday plate as ion detector. This basic drift tube setup and the corresponding operation principle have been known for years and are reported in detail elsewhere . After being injected into the drift region, ions move along the axis of the drift tube driven by a homogeneous electrical field. During their motion, the ion species are separated based on their ion mobility in the counter-flow drift gas. At the end of the drift region, a faraday plate shielded by an aperture grid detects the ion current. 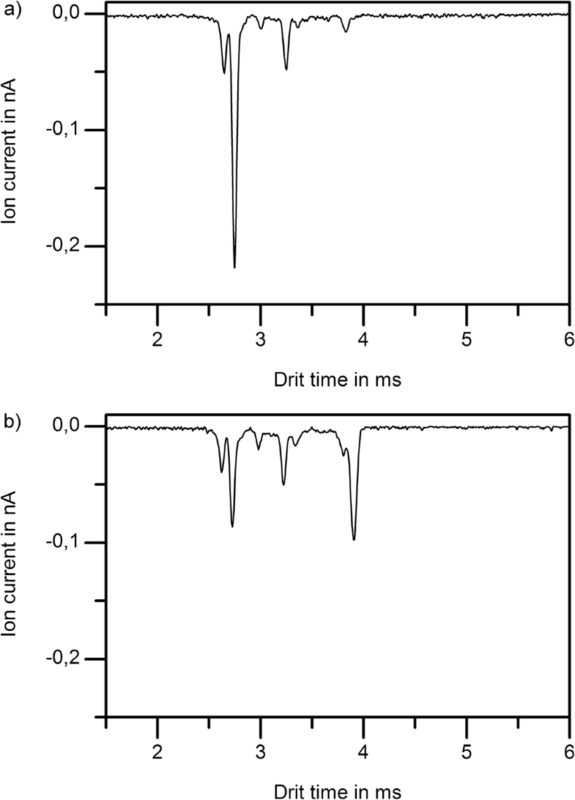 By plotting this ion current over time, the ion mobility spectrum is obtained. Typically, the electric field in the drift tube is provided by several drift electrodes, which are connected via a resistive voltage divider to the drift voltage. To generate a homogeneous drift field, a precise alignment of all drift electrodes, insulators and further mechanical parts is essentially. Thus, when developing a miniaturized drift tube and aiming for low production cost, the total number of components should be small. For easy integration, the miniaturized drift tube design presented in this work is designed to fit commercially available DIP sockets (7.62 mm row-to-row spacing, 34 pins with 2.54 mm pitch). This enables direct connection of the drift tube to the driver electronic circuit. A standard PCB containing electrodes and etched gaps as well as arches of stainless steel straps bended over the PCB, as shown in Fig. 1a, form the drift electrodes. The straps are soldered to the bottom side of the PCB and connected by vias with the top layer electrodes to keep the drift region free from contaminants caused by the soldering process. The drift electrode skeleton is placed inside a U-shaped polyether ether ketone (PEEK) housing and is sealed at the bottom side with a one-compound epoxy resin adhesive, as shown in Fig. 1b. Since PEEK is a thermoplastic material, parts can be produced by low cost injection molding. The miniaturized drift tube IMS is completed by an ionization chamber and a Faraday detector. The ionization chamber is also manufactured from PEEK and allows the adaption of two different ion sources to the drift tube. Ion generation is initiated either by electron emission from a radioactive 3H source (130 MBq) or by radiation from a custom non-radioactive X-ray source (Model XRT-50-2-Rh-0.6-125 by Newton Scientific Inc., Cambridge, Massachusetts, USA). It has been shown, that X-rays can be considered as non-radioactive substitute for the 3H ionization source, but the X-ray source should be placed orthogonally to the axis of the drift tube to avoid any offset current on the detector [14, 15]. Ions are injected into the drift region using a field switching shutter as described in . To keep production cost low, the Faraday detector is manufactured from standard PCBs. Ionization chamber, X-ray tube respectively, and Faraday detector are coupled to the drift tube using polytetrafluoroethylene (PTFE) O-rings and water jet cut foils. For drift and sample gas inlet, ionization chamber and detector are equipped with bores fitting a PEEK capillary (1/16″ outer diameter, 1 mm inner diameter). 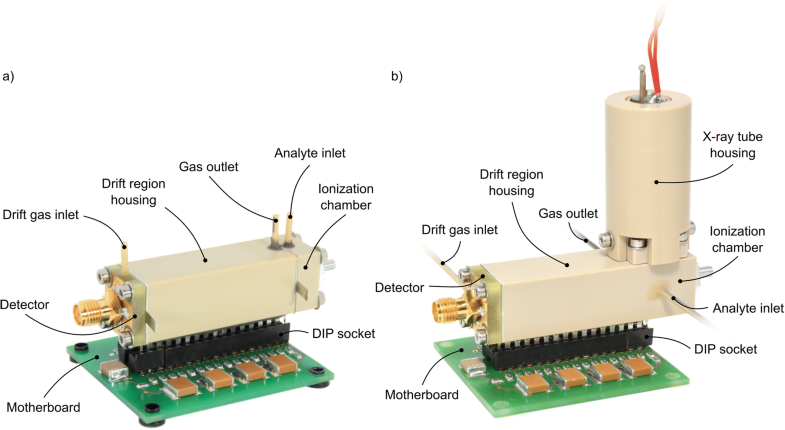 The sample gas is directly introduced into the ionization region, while the drift gas enters the drift tube at the detector through channels milled in the PCB. In Fig. 2, photos of the miniaturized drift tube with the 3H ionization source (left) and the non-radioactive X-ray source (right) are shown. Both IMS are plugged into a DIP socket on a motherboard. The depicted housing of the drift tube is only 15 mm × 15 mm in cross-section (outer dimensions). The overall length of the IMS including ionization chamber and detector is 56 mm (outer dimension) and the drift length is 40 mm. To achieve high analytical power, a homogeneous drift field is crucial. Therefore, the drift tube is connected to a resistive voltage divider via the DIP socket, as described above. For all experiments, drift voltages in the range of 2.5 kV are used. In addition, another high voltage of 3 kV is required as acceleration voltage for the X-ray source in the respective setup. The filament of the X-ray source is driven with a constant current of 640 mA. The field-switching shutter is operated at injection voltages in the range of 500 V.
The miniaturized drift tube IMS is integrated into a battery-powered mobile device including a closed gas-loop, high performance driver electronics, wireless data transmission and on-board data storage. To avoid contamination and provide clean and dry drift gas, the air inside the closed gas-loop is continuously pumped through two 13X type disposable filters (Balston Filter No. 9922–05-103 by Parker Hannifin Corporation, Haverhill, Massachusetts, USA). Figure 3 illustrates a schematic view of the pneumatic set up. Sample gas (100 mls/min), drift gas (120 mls/min) and carrier gas (10 mls/min) flow rates are controlled by the pumping rates and passive flow restrictions. The demonstrator including the lithium ion battery, (14.4 V, 6.8 Ah, part No. RH2024HD34 by Inspired Energy) and electronics (in-house development), pumps (models NMP05KPDC-B4 and NMP015KPDC-B4 by KNF Neuberger GmbH, Freiburg, Germany), filters, amplifier (in-house development, 900 MΩ transimpedance, 16 kHz bandwidth), 6-port-valve (Model MTV-6SL-N32UF-1 by Takasago Electric Inc., Nagoya, Japan) is built in a custom 25.5 cm × 20.5 cm × 10.8 cm housing and has a total weight of about 2 kg. The demonstrator is shown in Fig. 4. A defined sample gas flow of 100 mls/min (at 20 °C and 1013.25 hPa) is periodically pumped from the sample inlet (Fig. 3 - orange, continuous line) through the 250 μl sample loop. During measurements, the sample loop pump is turned off to avoid any interferences caused by mechanical vibrations, while the closed gas-loop pump is continuously running. 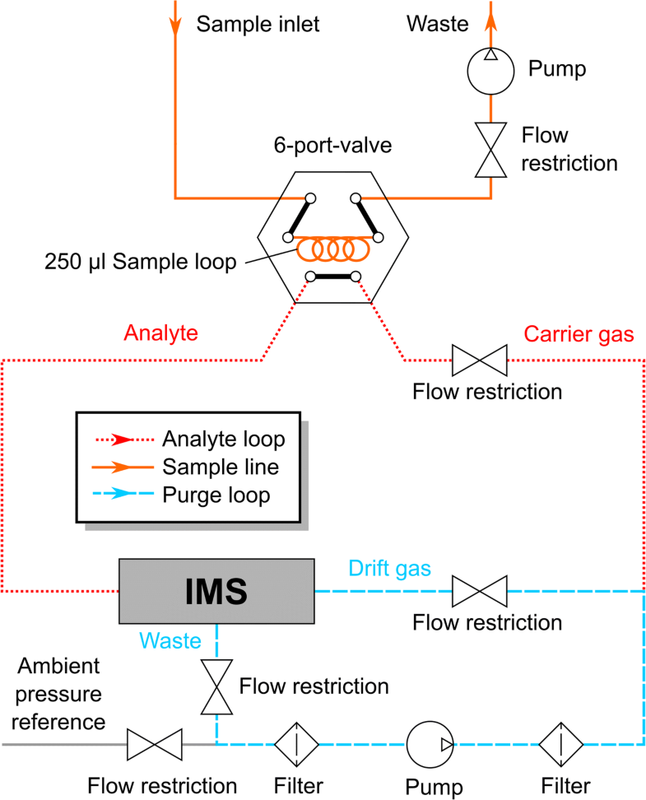 When a measurement is started, the gas within the sample loop is injected via 6-port-valve into the IMS by a carrier gas flow of 10 mls/min (Fig. 3 - red, dotted line). The 6-port-valve also allows easy integration of a gas chromatographic column for pre-separation (GC-IMS). An ambient pressure reference (Fig. 3 - grey, continuous line) is added before the filters to avoid unwanted pressure variations inside the closed gas-loop e.g. during valve switching. All operating parameters are summarized in Table 1. The IMS can be operated in positive and negative ion mode. To analyze the performance of the presented IMS, we measured its resolving power and detection limits. In a first step, the miniaturized drift tube is characterized without being integrated in the stand-alone demonstrator. Afterwards, the stand-alone demonstrator is investigated. In Fig. 5, the ion mobility spectrum of purified, dry (< 1 ppmV H2O) air is shown, both in positive and negative ion mode. The resolving power of the positive reactant ion peak (RIP+) at td = 2.96 ms is Rp = 63, while the resolving power of the negative reactant ion peak (RIP−) at td = 2.74 ms is Rp = 62. The spectra are measured using the 3H ionization source. In order to determine the detection limit and linear dynamic response range of the drift tube IMS, dimethyl-methylphosphonate (DMMP) has been used as model substance in the positive ion mode and methyl salicylate (MS) has been used as model substance in the negative ion mode. In this work, all limits of detection are given for measurement times less than one second and are based on the 3σ- definition. In Fig. 6, the ion mobility spectrum of 1.5 ppbV DMMP in purified, dry air with its monomer at td = 3.35 ms and dimer at td = 4.27 ms is shown. Using the 3H-ionization source, a detection limit of 40 pptV is calculated considering the monomer peak, respectively 500 pptV considering the dimer peak. Using the X-ray ionization source, the detection limits the DMMP monomer and dimer are about 60 pptV and 800 pptV. It is important to note, that an increasing X-ray filament current leads to significantly better limits of detection. However, here, the operating parameters of the used X-ray ionization source were set to generate RIP intensities comparable to 3H ionization. To characterize the negative ion mode, MS is used. The detection limits of MS measured with 3H-ionization source, is calculated to 30 pptV and with X-ray ionization is calculated to 60 pptV. The K0 value for MS is 1.55 cm2/(Vs). As described in the previous section, the miniaturized drift tube IMS with X-ray ionization has been integrated into a mobile demonstrator. Using the closed gas-loop with 6-port-valve sample injection results in a detection limit of 90 pptV for MS in purified, dry air. Compared to the detection limit using the drift tube IMS without closed gas-loop and 6-port-valve sample injection, this value is higher by a factor of three. This is due to dilution of the sample when mixing with the carrier gas. As proof-of-concept study, the stand-alone device was tested in an international field evaluation exercise of European Union’s TOXI-triage project in Athens in October 2018. The device was used as stationary detector to detect the release of a volatile, hazardous substance inside a large entry hall. Here, a non-hazardous compound simulated this substance. Due to the high amount of compounds in the ambient air and a direct sample inlet without pre-separation, the resulting IMS spectrum is rather complex, as shown in Fig. 7 (top). Nonetheless, it is possible to detect the simulant substance. Additionally, in Fig. 7, the ion mobility spectrum of the air in the hall at release time (Fig. 7 - bottom) of the simulant (td = 3.91 ms) is given. In this work, an easy-to-manufacture, miniaturized drift tube ion mobility spectrometer is presented. The design is based on stainless steel straps, which are bended over a printed circuit board (PCB) and form the drift electrodes. Since the drift electrodes are connected to a dual-in-line package (DIP) footprint, the drift tube is easy to connect to the driver electronics (plug and play). The dimensions of the drift tube are only 15 mm × 15 mm in cross-section (outer dimensions) and 56 mm in length (outer dimension). Nevertheless, the design provides a high resolving power of Rp = 63 at a drift length of just 40 mm and a drift voltage of 2.5 kV. The limits of detection for one second of averaging are 40 pptv for dimethyl-methylphosphonate monomer, 500 pptV for the dimer and 30 pptv for methyl salicylate using a 3H ionization source. Using X-ray ionization, the limits of detection are 60 pptv for dimethyl-methylphosphonate monomer, 800 pptV for the dimer and 60 pptv for methyl salicylate. It is important to note, that an increasing X-ray filament current leads to significantly better limits of detection. However, here, the operating parameters of the used X-ray ionization source were set to generate RIP intensities comparable to 3H ionization. The system has been successfully tested in an international field evaluation exercise to detect the release of volatile, hazardous material inside a large entry hall. This project has received funding from the European Union’s Horizon 2020 research and innovation programme under grant agreement No 653409.